They call it the wiggles. In teacher Emma Marley’s Grade 5 class at Strawberry Vale elementary, the wiggles includes pent-up energy, anxiety, giggles, or anything, really, that leads to a lack of focus. This year, kids at Strawberry Vale are burning off the wiggles on a silent bike trainer. Recognizing the wiggles is part of the self-regulation movement, which itself recognizes that traditional classrooms aren’t designed to meet the needs of all children. The self-regulation trend is growing nationally and is showing up more often in SD61 schools. “The kids know when they have energy to burn, or the wiggles,” said Marley, who is also the vice principal. The idea is the exercise stimulates the children to get their minds back on track for learning, and it works, Marley added. Strawberry Vale started the school year with the purchase of four silent bike trainers. It’s been such a success its Parent Advisory Council has purchased 10 more for $7,000, to have one in every classroom. They’ll be delivered and assembled soon. “Kids use it for five minutes [when it’s appropriate], or longer if there’s no one else waiting for it,” Marley said. While Marley’s class will soon have a bike trainer of its own (the trainers have been on rotation as part of the pilot project to start this year) Marley has also employed a variety of options that turn distraction into focus in the classroom. Other strategies include standing, lying on the floor, or walking around. Sometimes students step outside and jog their memory with a quick out-and-back run to what’s known as the special tree (visible from the glass door), Marley said. But for now, it’s all about the bike. “The bike is quite popular, as you can see by all the names posted on the waitlist,” said Grade 5 student Dylan Hudder. “I like to ride my bike outside, it makes me relaxed, so does this,” said Grade 5 student Gunnar Barlee. A little ways down the road at McKenzie elementary, kindergarten teacher and vice principal Melanie Postle has a silent bike trainer in her class and is a strong advocate for having at least one in every classroom. Postle has now helped order 90 of them for SD61 and Saanich SD63 classrooms. It’s part of a broader strategy she employs, which also uses lamps instead of the standard fluorescent ceiling lights, as research shows the latter to be disruptive to the body’s nervous system. “They have made a major positive impact in our school community and in our district,” Postle said. It started when Postle and another McKenzie teacher, Denise Sparrow, looked into using silent bikes a few years ago. It was a long and sometimes arduous process to find the funding, she said. Eventually, Santas Anonymous charity funded McKenzie’s first bike purchase. 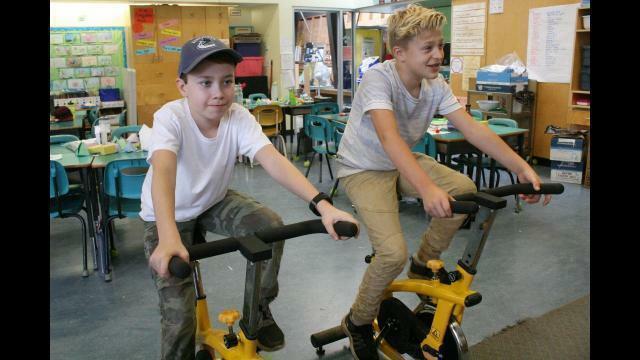 “We received additional funding last year from Santas Anonymous for two more bikes and we have now managed to place a bike in every [McKenzie] classroom,” Postle said.